"It’s not the size of the girl in the fight but the size of the fight in the girl!" When Katie Bradley attended her first Taekwondo class at the age of six, she had very little idea of how far it would take her. Joining on her Dad’s advice to help boost her confidence and to overcome bullying, she quickly fell in love with the sport and, after years of hard practice, is now representing Great Britain under 21s. Katie has only just become a full senior, but the mechanical engineering student has already represented her country four times. In 2014 Katie brought home a World Junior bronze for Great Britain and became Commonwealth Junior Champion in Edinburgh for Team England. “Taekwondo is my life and my goal is to compete at the Tokyo 2020 Olympic Games. Being a Sporting Excellence Scholar at University of Plymouth means the world to me and will put me in the best position to achieve my goal. Having seen an early share of success in the senior ranks – winning the German Club Championships, Tongeren Open, British International Open and Berlin Open – Katie is already demonstrating to the best in the world that she is a force to be reckoned with. She’s also keen to excel in her studies and is putting in lots of hours both in and out of the training room. "I’m so pleased to be representing Great Britain and I hope I can put in a good performance and bring home a medal, not just for the country but also for Plymouth. I want to achieve good grades in my degree studies and balance this with attending a number of G-class ranking internationals. I’m also hopeful to be selected to represent Great Britain whenever possible." “It’s not the size of the girl in the fight but the size of the fight in the girl! So I’ll keep doing what I’m doing, doing what I love, and do everything I can to make the Olympics!" “I’m so happy to have won the title for myself and as a representative of University of Plymouth. 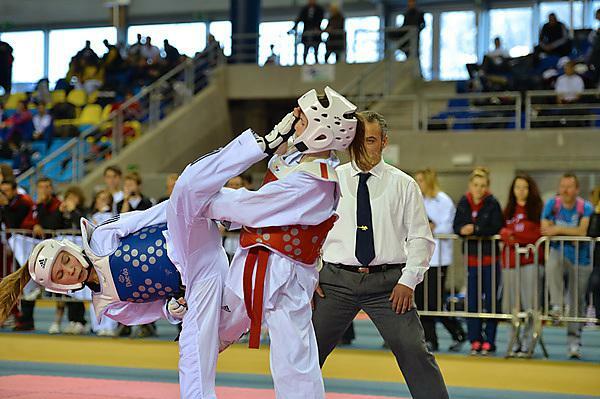 Katie Bradley took the British Student Taekwondo Federation National Championship title in the -53kg weight class.